After going to Florida in March my computer crashed and I had yet to back up some of the photographs that I had taken during the early part of 2009. I finally got it all recovered this week and remembered seeing a very interesting Sapsucker/Red-bellied Woodpecker behavior. Down in Florida the Sapsuckers commonly drill their wells in palm trees. While watching one work its way from well to well I noticed a Red-bellied Woodpecker doing the same. I had never seen a Red-bellied Woodpecker use a Sapsucker's well before. You can see the Red-bellied Woodpecker on the tree in the background. Interesting behavior and great that you were able to get photos as well. 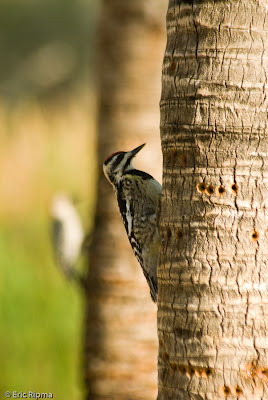 Great capture of the female Yellow-bellied Sapsucker Eric! The Red-bellied Woodpecker in the background is a bonus. I thought that any bird species interested in sap would use any available well. I was amazed to see an Anna's Hummingbird and a Nuttall's Woodpecker drinking out of the same wells in an oak tree on my property. What wonderful observations. Nice shot too. What a great photo. I learn so much when I visit here. Thank you! Quite interesting info and a great photo to boot! Great DoF with the Red-bellied Woodpecker in the background. Thats really interesting one...nice to see this bird..